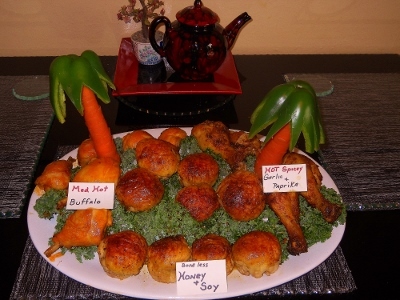 Made a chicken platter for a birthday party. I like the idea of the palm trees...your invention? Nice, Joey! I bet that was a hit at the party. How did you keep the carrots standing up? I put 3 tooth pics on the bottom of each carrot. There is a piece of 3/4" thick styrofoam that was cut to 4"x7". I kept the styrofoam from moving by brushing the bottom of the platter with honey! Then covered with kale.